There is growing interest in an Article V Convention to amend the Constitution of the United States. But it's NOT the Constitution that is the problem...the federal government has far exceeded it's constitutional authority and is far and away out of control. As it stands now, our Constitution and the Republic that our Founding Fathers intended and our very Liberty are under attack. So, what to do? The question is, "What is the best way to reclaim the Republic and restore the Constitution of the United States?" 1. We can try to elect constitutionally conservative candidates but is there time to save the Republic by waiting to go through several election cycles? Will the newly elected servants remain true and honor their Oath of Office to "preserve, protect, and defend the Constitution of the United States against all enemies, foreign and domestic..." or will they be co-opted and corrupted and turn into the same self-serving political whores we have now? 2. We can call an Article V Constitution to pass a few key amendments to force the federal government to change its behavior and pray that it doesn't turn into a runaway convention resulting in the complete trashing our current Constitution for a new, more "modern" advocated by sitting Supreme Court Justice Ruth Bader Ginsberg when being interviewed. Personally, I view her remarks as a violation of her Oath of Office which is at least Perjury and possibly Treason. Either way, the risks are perilous to our Republic, our Constitution, and our Liberty. Stand Up to American Legislative Exchange Council (ALEC), Americans For Prosperity (AFP), Convention Of States (COS), Tea Party Patriots, Tea Party Caucus, Tea Party Express, Tea Party, Tea Party Nation, National Tea Party Federation, Tea Party Leadership Fund, and Freedomworks. ALEC is heavily involved with the Convention Of States (COS) a.k.a. Con-Con. Most of the legislators that went to Mount Vernon for the COS meeting in December 2013 were ALEC members. Congress will not obey the U.S. Constitution today. What makes you think that Congress would obey the Constitution if changes were made? Is the Convention Of States connected to the Council On Foreign Relations? Michael P. Farris is Head of Convention of the States Project, better known as a Constitutional Convention (Con-Con), and President of Parentalrights.org in which Council on Foreign Relations (CFR) member Grover G. Norquist is the Director. Mr. Farris is also the advisory board member of Christian Freedom International. George Soros is also a member of the Council on Foreign Relations with Grover P. Norquist. Are the Convention Of States' Key Supporters Connected to Common Core? Huckabee admitted right up front on his show that he is losing a good sized chunk of his TV audience. But a name change won’t change the philosophy or the centralized control policies that have been put into place. Remember the past? The names have changed, but the government control is the same. First, it was "Outcome-based Education"... then "Goals 2000"... then "No Child Left Behind"... and now "Common Core". We question Huckabee's stance on Common Core, especially if he's still endorsing the Convention of States. Here's a link that shows his letter to Oklahoma lawmakers urging them to back Common Core. Also, Mike Huckabee is co-chairman of Alliance for a Healthier Generation which Bill, Hillary, & Chelsea Clinton Foundation co-founded. Click here to follow the dots. Mike Huckabee is also an advisory board member of Secure America Now with CFR (Council on Foreign Relations) member John R. Bolton and CFR member Devon Gaffney Cross. Click here to follow the dots. Click here to see info about Huckabee and others endorsing the COS project. Click here for another article that Exposes Common Core ALEC corporate connections. Some of these groups are the same ones supporting the Convention Of States (COS). For an ALEC/Common Core refresher course, click here. Do you really trust these groups attempting to change our U.S. Constitution? It looks as though our state lawmakers have taken all the federal grant money they can get their hands on and have jeopardized our children with Common Core curriculum in this so-called Race to the Top. Don’t let your legislator tell you that they can control or limit a Constitutional Convention (also known as an Article V Amendment Convention). That is a lie, and it is deceptive. Under Article V (five) of the Constitution, our founding fathers established two methods for future generations to add amendments to the Constitution: Method 1: Two-thirds of both houses of Congress can propose an amendment, and then three-fourths of the states ratify it… or not. (This is the only safe method.) For Method 2 below, REMEMBER: the U.S. Congress decides the mode of ratification. The state legislators can be circumvented if the Congress calls for ratifying conventions. For the evidence showing the inability of the states to limit an Article V Convention, click here. Method 2: Two-thirds (34) of the states call for a federal constitutional convention, and then three-fourths of the states ratify whatever amendments are proposed by the convention. (This method must be avoided at all costs. This method could lead to a runaway convention in which our original Constitution would be scrapped and a new Constitution would be substituted consequently stripping us from our bill of rights.) There is a proposed Constitution already waiting for the New States of America. Mark Levin Wants to Play Russian Roulette with the U.S. Constitution (be sure to click on this link) Our legislators have sold us a pack of lies about the Convention of States (COS) that they have NEVER verified, and they're selling it as truth. Don't take anyone's word for it. Everyone needs to do their own research if they want to find the truth. If you want to email us about this article, please reference the Constitution, Declaration of Independence, and/or federal laws that support your rebuttal. Thanks for reading! Please remember to forward this email to everyone on your list. Recently, The New American has reported on the efforts by radio talk show host Mark Levin and others to push for a constitutional convention (a convention of the states, in the parlance of the proponents). Unfortunately, many otherwise well-educated and well-meaning conservatives have succumbed to Levin’s siren song and they have gone so far as to deny the constitutionality of nullification and to insist that an Article V convention is the only way to restore the balance of federalism in our Republic. Fighting for the Constitution as given to us by our Founders is a noble goal and the anxiety of the conservative con-con collaborators is understandable. We at The New American and The John Birch Society welcome the help of all those courageous enough to enlist in the battle to defeat the forces of federal absolutism. We part company with those pushing for an Article V convention, however, and we believe that a constitutional convention is not the right way to stop the federal assault on our Constitution and the freedoms it protects. The New American and many other liberty-minded organizations promote nullification as the “rightful remedy” for curing the constant federal overreaching. We believe that as the agent of the states, the federal government has exceeded its contractual authority and the states as principals have the right to refuse to ratify any such usurpation. Since the publication of Levin’s admittedly popular book, the battle between those promoting nullification and those advocating for an Article V constitutional convention is a topic getting plenty of coverage in the alternative media. There is another uncomfortable aspect of the Article V movement that is not being discussed, however, but needs to be, particularly in light of the good people who have associated themselves with it. Within the ranks of those clamoring for an Article V convention are found numerous extremely radical, progressive, and socialist organizations that otherwise would have little in common with the conservatives fighting on the same side. On its website, Wolf-Pac pushes for an Article V “convention of the states” as the best way to accomplish its “ultimate goal:"
inform the public by running television commercials, radio ads, social media, internet ads, and using the media platform of the largest online news show in the world, The Young Turks. In fact, Soros funds nearly every major left-wing media source in the United States. Forty-five of those are financed through his support of the Media Consortium. That organization 'is a network of the country's leading, progressive, independent media outlets.' The list is predictable — everything from Alternet to the Young Turks. That’s right. George Soros — the financier of global fascism — is pumping millions of dollars into the same Article V campaign that is being promoted by Mark Levin, Rush Limbaugh, Sean Hannity, Glenn Beck, and other popular conservative spokesmen. This should be enough to convince all true conservatives, constitutionalists, and friends of liberty to run headlong away from the ranks of the Article V con-con army, regardless of how popular and persuasive their generals may be. It will likely surprise these devoted, but deluded, Article V advocates that Wolf-Pac is just the tip of the iceberg. These good people would be wise to take a look at this heavily abbreviated roster of their radical fellow travelers in the con-con movement, each of which is a registered “founding member” of the “Move to Amend” coalition. Mind you, hundreds more groups “committed to social and economic justice, ending corporate rule, and building a vibrant democracy” are gathered under this umbrella. This hardly seems to be a corps that most Levin listeners would be happy to stand shoulder to shoulder with in the fight for a “convention of the states.” In fairness, these allies likely don’t share their conservative cohorts’ love and loyalty to the Constitution. It’s time these right-minded men and women know with whom they are associating. Don’t forget, George Soros’s billions are funding these fringe groups and politicians aren't known for their ability to resist hefty campaign contributions. Conservatives should shudder at the specter of a convention endowed with power of this magnitude, populated by activists who have a Soros credit card in their pocket and a commitment to “social justice” as their purpose. All the good intentions of the conservatives in the Article V camp would not be enough to force all these devastating changes to the Constitution back inside the progressive Pandora's Box. Readers are encouraged to click the links provided in this article and to investigate for themselves the agenda of the various Article V advocates and to determine if it's worth the risk to our Constitution that would be posed by the presence of these groups in the "convention of the states." Finally, the startling information set out in this article is not meant as an attack on Mark Levin or anyone else working to call a “convention of the states.” Rather, it is intended to help the thousands of committed constitutionalists who find themselves believing in the Article V gospel he’s preaching to realize who’s sitting in the pews with them and whose money built the church. Added by admin on September 6, 2013. Mounting frustrations with the size and scope of the United States federal government have ebbed and flowed over the years with calls for a Constitutional Convention, touted as the solution for controlling an leviathan government. Mark Levin’s current book, The Liberty Amendments: Restoring the American Republic, promises a “quick fix” but at what cost? Political commentators Sean Hannity and Rush Limbaugh have also taken up the cause. In the past such movements always died when the public realized the consequences of such dangerous undertakings. There have been two Constitutional Conventions in our history and both were held in secret. The first was to alter the Articles of Confederation. Rhode Island chose not to participate for unknown reasons. When convened, the Articles (all delegates being in agreement for revision) were completely abandoned and our new US Constitution was born. Although our current Constitution is a fine document by all accounts, some things were lost such as the unanimous ratification among the States for amendments The Constitutional Convention, in effect, became a “runaway” convention in which the prior form of government was scrapped and a new one created, all in secret. The second, convened on February 4, 1861. Forty-three delegates from South Carolina, Alabama, Mississippi, Georgia, Florida, and Louisiana assembled in Montgomery, Alabama, to write a provisional constitution for the Confederate States of America, also done in secret. The Congress, whenever two thirds of both Houses shall deem it necessary, shall propose Amendments to this Constitution, or, on the Application of the Legislatures of two thirds of the several States, shall call a Convention for proposing Amendments, which, in the Case, shall be valid to all Intents and Purposes, as part of this constitution, when ratifies by the Legislature of three fourths of the several States, or by conventions in three fourths thereof, as the one or the other Mode of Ratification may be proposed by Congress; …. 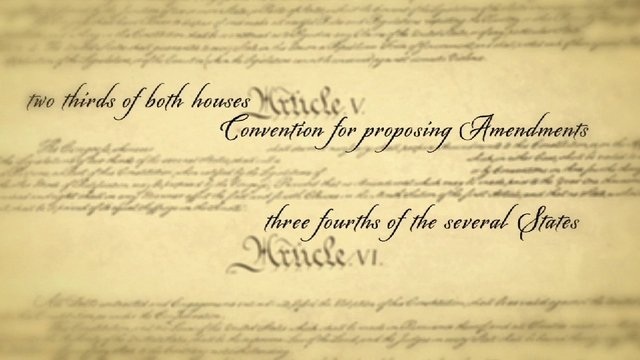 In other words, there are two ways to make changes to the Constitution (Amendments): (1) by two-thirds vote by both Houses of Congress; or (2) on Application by the legislatures of two-thirds of the States calling for a convention for proposed Amendments, known as a Constitutional Convention or Con-Con. Amendments are then ratified by three-fourths of state legislatures or state conventions. In 1983, the Con-Con movement hit a high point when Missouri became the 32nd State (out of 34 required) with calls for a Balanced Budget Amendment. Since then, several States have considered calling a balanced budget Con-Con but all have decided the risks were far too great. Thus far, 11 States have withdrawn their previous endorsement. Since then, there have been numerous attempts to resurrect a Balanced Budget Amendment in different guises. In 2009 Prof. Randy Barnett’s proposed “Bill of Federalism” (10 amendments) was marketed to Tea Partiers by the Wall Street Journal and Michael P. Leahy (Top Conservatives on Twitter) as a threat (nuclear option) to force Congress to listen to conservatives. Surprisingly, even Judge Napolitano (who should know better), made the Con-Con pitch. Currently, none gathered enough national steam. Proponents cite the fact that (1) three-fourths of the States are needed to ratify the Amendment(s) and thus, is a strong enough deterrent against “bad” amendments, and (2) that State legislatures can limit the size and scope of a Con-Con (to which history proves and honest proponents admit is false). To quote Prof. Randy Barnett “An amendments convention is feared because its scope cannot be limited in advance” and yet he advocates in favor of this remedy. Opponents of Con-Cons cite the risks involved. They are : (1) Once called, it becomes its own authority and cannot be limited, (2) It can become a “runaway” convention in which our current form of government and its constitutional protections are completely thrown out and a new form of government is created, (3) Given the current caliber of our representatives, our delegates cannot be expected to have the knowledge, understanding or commitment to limited governance, liberty and freedom shared by the original drafters of our Constitution. In fact, many have been busily disregarding and disrespecting it for years despite their oaths of office when it serves their own interests.Additionally our representatives are increasingly beholden to special interest groups and corporations, and (4) The public’s lack of education on the Constitution and its virtues has led to increased government dependence that are mitigating factors in favor of bigger government. Considering the risk factors inherent in a Constitutional Convention at a time when our country is increasingly polarized, one has to ask, why choose the “nuclear option” when the Constitution provides for more practical, safe remedies? Many of the problems we face today are a result of changing or misinterpreting the Constitution in the first place. Why pass more laws or amendments, if the government refuses to follow the ones we have? They will not follow a balanced budget amendment if they don’t want to. We need to address the real problem of our government violating the laws we have. The people MUST elect and then INSIST our representatives be held to account in faithfully upholding the LAW –THE CONSTITUTION (which limits the size and scope of government in the first place). Many of our problems would be solved as a result. Furthermore, problems can and need be addressed directly in the States by refusing to allow or recognize unconstitutional laws within their borders and refusing to be controlled by a carrot and stick method of force (taxes) used by the federal government. The process of nullification is the rightful remedy for States, not to be taken lightly, of course, but as a last line of defense against a federal government that has broken its limits. The States created the federal government not the other way around. Enforcement of the Constitution is more practical, cost effective and less risky than revising the Constitution. Don’t be fooled by the false promises for a quick and easy fix. It will cost you more than you bargain for.